Our goal is to combine domestic and new foundation stock to develop a happy, healthy basenji for your pleasure in the show ring, field and home. Our Dogs: Learn about our philosophy and meet our basenjis. Contenders: These are the dogs we are currently showing. Watch for their successes in the shows. Pups: Current Puppies and Puppy Plans Here are our puppies with photos of parents, pedigrees and photos as the puppies grow up. Adults Available: Sometimes we have adult dogs available. These are often young adults who we have raised ourselves to show. Others are dogs that have come back to us for a variety of reasons. 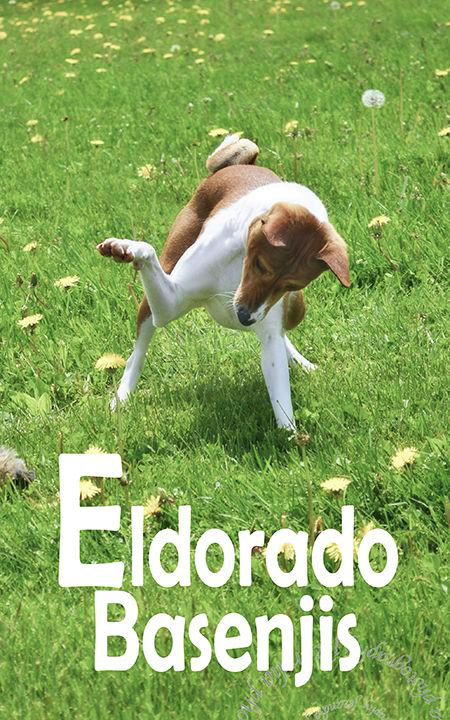 About and Contacts: A few words about the people of Eldorado Basenjis. Where we are and how to contact us. Links you may find interesting and educational. Gallery: Owners send us cute photos of the puppies and adults who go off to new home. FAQ: Frequently Asked Questions – We've answered some of the questions we are often asked. Feigh become first ever MACH3!